Think Harley Davidson and you think lumbering chrome plated pose-mobile, right? Would you believe that Harleys have the potential to be rip snorting sports bikes that could give any Ducati or Honda a run for its money? Neither did I until I sampled the Buell Cyclone, but first a quick history lesson. For the last two decades, Eric Buell has been an engineer working for Harley Davidson, and a part time bike racer dedicated to making racing frames for tuned Harley engines. He was good at it too, and bit by bit he turned into a minor manufacturer of Harley based specials. A couple of years back he upped the stakes and went into partnership with Harley Davidson to start a brand new marque, Buell American Motorcycles. These bikes are now on sale in the UK for the first time, and the bike I have been riding is the first one let loose on the roads of Scotland. Believe me, let loose is the right phrase! What we have here is Harley's venerable old 1,200 cc Sportster engine, but heavily breathed on to give 86 bhp, and a monster dose of torque. This is tied into an extremely rigid, geodesic designed tubular frame, to which are attached the minimum of components to make a bare bones motorcycle. Not a cheap motorcycle mind you at £8,295, but quality costs, and this bike has lots of trick kit in its suspension, brakes and cycle parts. Point it down a bendy road, and you soon see where the money has gone. This is one seriously rapid bike, but in a way that has almost been forgotten. To riders raised on a diet of screaming, revving Japanese 4 cylinder engines, the feel of the Buell will come as a complete surprise. It climbs on the cam at about 2,500 rpm, and then just pulls like steam train. You can rev it hard, or short shift, it makes no appreciable difference, as there is such a broad power band. It has the feel of an old British bike, the sort your dad would remember, only it covers the ground in a way that no 50's cafe racer ever did. It might feel like a Norton, but it goes like a Fireblade. It also makes a truly unique noise (and lots of it) which is decades away from the high pitched whine of todays superbikes, it has a deep roaring note that will attract the attention of every Eddie Cochrane fan within a five mile radius! 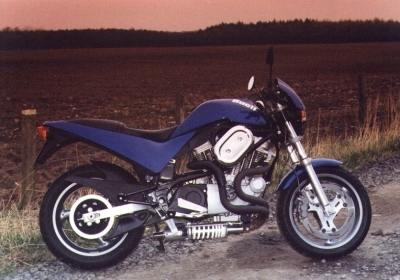 The Buell has the chassis to go with this tidal wave of grunt too. It is painfully hard work on the motorway, but show it a twisty road or a series of roundabouts and it rips though them with confidence. This is clearly a chassis built by a racer, it is stiff and unyielding, which is of course exactly what you want for maximum handling finesse. In the real world though roads have lumps and bumps, and these can upset the road-holding. I did not have time to try any suspension adjustments, but a bit more compliance would be to my taste. No worries with the brakes though, they are stunning. The front may only have a single disc, but it is huge and is gripped by a six pot calliper of colossal power. Go easy on anything less than clean dry tarmac would be my advice. By now you must be thinking that this is the greatest bike ever invented, but life is rarely that simple. At town speeds where the engine is off the cam, it throbs through the whole bike so violently as to make you eyeballs wobble. Blurred vision and fast bikes are a bad mix. The ergonomics are less than wonderful, your knee bangs on the air cleaner, the clutch is achingly heavy in traffic, and the all important seat/backside interface is truly painful after more than an hour in the saddle. It is Union made in the good old U S of A, where labour rates are high, so it is inevitably not as cheap as its rivals. So if you want a sensible, quiet, practical bike that is great value for money, look elsewhere. On the other hand if you want thrilling modern performance, but with a touch of that old Harley Davidson magic, this Buell is a must have. The only Scottish outlet is Alvins Motorcycles, at the foot of Leith Walk in Edinburgh. Remember to tell them you read it here first.